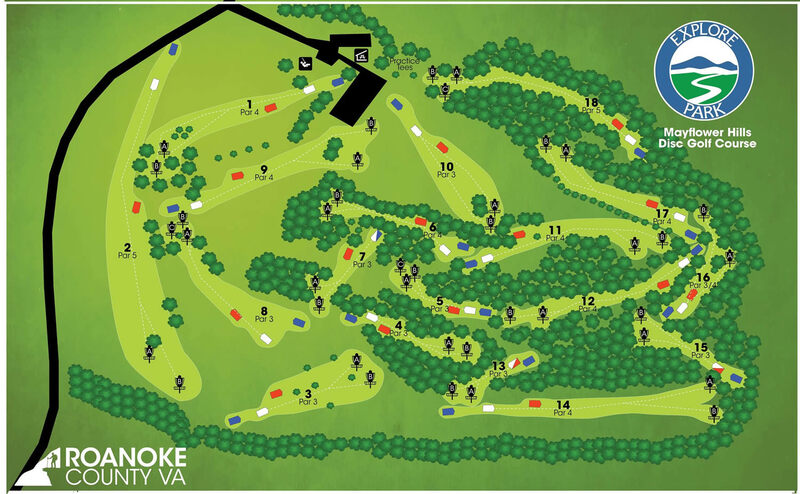 Championship level 18 hole course with three sets of tees and multiple pin locations. This course offers many types of shots and lots of hiking with a variety of elevation and foliage. $3 per day/person. I-581; exit 6. Go east on Elm Ave. for 0.1 mile, then continue straight onto Bullitt Ave. Go another 0.8 mile to a right on 13th St. Go a mile to a left on Riverdale Rd. Go 0.8 mile to a right on Highland Dr. Go 1.9 miles to a right on VA-658 (Rutrough Rd) The park entrance is down on the left. Have you played at Mayflower Hills Disc Golf Course? Be the first person to review this course!